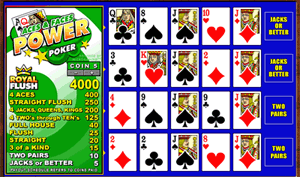 Aces and Faces Poker is a standard video poker. It is played with one standard deck of 52 playing cards that is shuffled before each game. There are no wild cards and the maximum payout is 4,000 coins. It has high payouts for combinations of four Aces or four Face cards. Face cards are all Jacks, Queens and Kings.